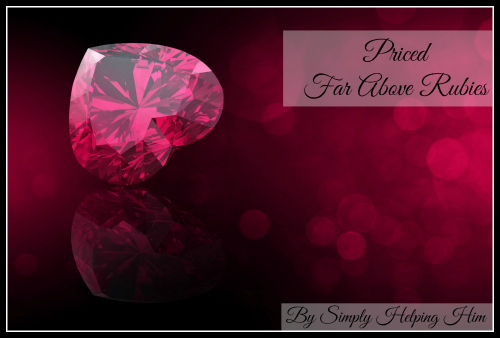 What exactly does it mean for a wife to be “priced far above rubies”? How do you know what it takes to fit this criteria? How do you pursue being “priced far above rubies”? This phrase comes from a passage in the Bible that women are either drawn towards or it’s a passage they avoid. For years I was one of the wives from the latter groups. As I’ve stated before Courtney from Women Living Well is who God used to teach me to love this chapter in the Bible. Proverbs 31 lays out the life of a wife and mother who looks well to the needs of her home. in this chapter a mother is giving advice to her son as to what attributes he should look for in a wife. When you think about it that way, you realize that as a mother you will do, or have done the very same thing for your own son. After all you want your daughter-in-law to love and care for him, your grand-kids and you wouldn’t mind loving her either. So what exactly did Lemuel’s mother feel was of great importance in a wife? What qualities did she recommend her son look for in his search for a lifelong companion? Let’s take a peek at the qualities that we need to pursue as wives. A chaste woman who has good morals. Her husband can trust her and she will live frugally. She ensures her behavior will speak well of her husband, she seeks to please him in all she does. She must be ready to help in anyway possible and/or necessary to help her husband and care for her family. 5. A woman who ensures food is on the table. She will go get food from wherever she must to feed her family. 6. A woman who is willing to pull long days and nights to get everything done. She doesn’t let things get pilled up, she is diligent in maintaining her home. 7. A woman who is wise in her business dealings. She looks for ways to bring in income to her family and works hard to do so. 8. A woman who is not too good for hard work. She is willing to push herself to do things that are not considered “wives’ work. 9. A woman who ensures she produces quality work. She pulls long night hours to do her work well. 10. A woman who can make things her family needs. She puts her hand to making things herself, she doesn’t have to rely on anyone else to provide them for her family. 11. A woman who is compassionate to the needs of others. She is concerned for those less fortunate than she and her family. She reaches out and helps those she can. 12. A woman who prepares necessary clothing for her family. She takes care to keep her family dressed appropriately throughout the seasons. 13. A woman who takes care with her appearance. She keeps herself clothed well, she is not lazy in her attire. 14. A woman that knows her business. She does her work well and sells it to benefit the family. 15. A woman whose strength and honor are a part of her personality. She has a strong composure, her life and actions are honorable. 16. A woman whose words are selected carefully. She speaks with wisdom and kindness. 17. A woman who is not idle. She knows what needs to be done and doesn’t avoid it. 18. A woman who fears the Lord. She does all these things because she fears the Lord, and seeks to do all things for Him. Being a wife is an honor and a high calling, it is not a position to take lightly. We must ensure that our actions and words bring honor to our husbands. Living for the Lord, following His direction for being a help meet to our husbands, and mother to our children is where our focus is to be. When we are faithful in serving the Lord in these ways, then we will be blessed by our children and our husbands. They will honor us by rising up, praising us and calling us blessed. What greater prize could there be than to know we’ve been faithful to the Lord and touched our family’s lives by our faithfulness to them? Wonderful summary – I also liked how she bought and sold land- to me it really added dimension to her role! There is so much to learn from her! Thanks for stoppin by! Blessings! This is a wonderful summary, Misty! and you are exactly right – there are lessons here for our sons as well as our daughters. “Wisdom” is referred to in the female tense all throughout Proverbs, and so the character qualities of this ‘woman’ would be a wise thing for us to pay attention to. Thank you for the quick study on this today! Oh yes Proverbs holds so much for us to learn and teach our children! Thank you for stoppin by! Blessings! I read these verses at my mother-in-law’s funeral service – she truly was the embodiment of the Proverbs 31 woman. Thank you for these precious words and for linking up with the #HearItUseIt community this week. How precious, it truly is a blessing to have a mother figure who personifies the Proverbs 31 woman. Thank you for stoppin by! Blessings! I love that this woman first of all abides with God. She is at home with Him. And all the rest is a fruit from being with Him. How precious it is that He calls us to Himself first… Thanks! Yes! That is key, coming to God first! Only then can we fulfill what He calls us to. Thank you for stoppin by! Blessings!